It’s about a wolf who appeared one day outside of Juneau, and began a six-year odyssey of relationships with local dogs, curious onlookers, the predictable wolf haters and those who understood enough biology to be both riveted and worried about what might eventually happen. Nick Jans was one of the first people to spot the wolf; that’s his dog on the cover, during the wolf and dog’s first meeting when Jans was sure his dog was about to die. 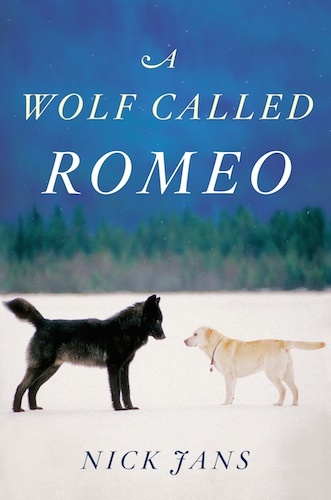 Instead, Romeo began a unique and compelling relationship with local dogs, authorities and wolf detractors, all beautifully described by Jans. I really couldn’t put this book down, and finished it early into the wee hours, fascinated by the story, drawn in by the writing and Jans’ thoughtful approach that encapsulates everything there is to say about our complicated and contradictory relationship with wild animals. It is one of my favorite books of the year. I always love the books you recommend! I just ordered a copy. Can’t wait to read it. Thanks for taking the time to tell us about it. here in NW Alaska, we have a lone wolf roaming our neighborhood, too, We see him at night and in the early morning hours. Beautiful animal; I wish him a long and happy life. Having said that, I won’t let my little dog out the door on her own while he’s around, because she’d make a quick snack before dinner for a wolf. He will most likely have a longer life if he stays away from houses and people. Unfortunately, people in Alaska are generally very trigger-happy when it comes to wolves or bears. I am reading “The Grizzly Maze” by Jans, an account of Timothy Treadwell, who lived (and died) among the Alaskan grizzlies. I find Jans remarkably even-handed, acknowledging Treadwell’s faults along with his talents. He is a compelling writer, and pulls together a lot of diverse opinions smoothly. I just found out about the Romeo book today, and wondered what you would think of it. Your rec makes it a must-read. I visited Juneau last year, and saw the plaque put up to Romeo. Do you think Romeo might have been a wolf-dog, maybe from a dog sire, wolf dam with a lower fear factor? Picked up a copy today along with Boys in a Boat about the US crew team at the ’36 Olympics. I’ve heard nothing but praise for that one and the few pages I’m into it are certainly promising. I may just put it on hold though in favor of Romeo. Here is to us all striving to understand more about the amazing world and the wildlife that we share it with. I’ll look forward to reading this. Without spoiling the ending, can you say if it’s a tragic end to the book? If he’s going to be killed by mean people, I can’t read it, haha. I find it too hard to shake tragedy that involves dogs (and now, apparently wolves, it seems, as I’m actually asking the question). Kat: I LOVED Boys in the Boat! And… now that we’re on it: Bread and Butter and The Vacationers. Both are fantastic. To lin: It looks as though wolf biologists were convinced that Romeo was not a recent hybrid and they categorized him as a ‘wolf.’ However, did you see the research that suggests that the all black coat color in wolves was derived, a long time ago, from domestic dogs? But your question is a good one, and I guess no one would ever know without doing DNA testing. The author does address this in the book, so he’ll have a lot more to say. The first thing I did was google it to read a review and see if I could determine if the wolf dies so I could know whether to read it or not. Lets just say I’m probably not going to be reading it. But it sounds like a wonderful book. (I don’t feel too nutty as there is an entire site devoted to people like me: doesthedogdie.com). Thank you for the recommendation tho! @Jeanie and Laurie: If you google “Motley Dogs Romeo Juneau” the first citation gives a brief history of what is known about Romeo. From there you can decide if you want to read the book. Added to my wishlist. I will have to save it for a less vulnerable time in my life, but it sounds like a very important book for those of us on the side of the wolf as a species. Wonderful book indeed. Many thanks. ordered a copy for the library where I work too! I just recently moved out of Juneau, Alaska and saw and walked with Romeo several times through his years at the Mendenhall Glacier. He was a very special wolf, and Nick Jans is a wonderful guy 🙂 I’ve been to many dog classes with him and his wife. Sarina, I love hearing that you met Romeo and know Nick. Let us know what you think of the book, I’d love to hear. Nick comes across as a good man, love hearing that he is. B) he wanted to mate.Sometimes wolves mate with female domestic dogs especially when the latest are in eustrus.He had just wanted to mate thats all and that why he skillfully aproached the human territory being at the same time patient with the dogs.But anyway it is a shame that Romeo was shooted- he did not deserved it. But i intend to buy the book. e.g I have read your article about wolf-dogs. It was excellent. Sorry about your dog .My familly has adopted a stray dog named Sirroco and he is wonderfull.